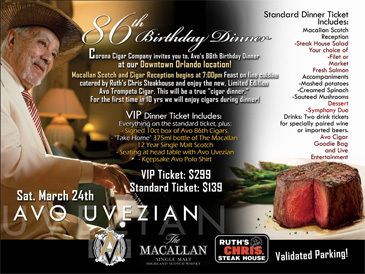 Saturday, March 24th, 2012 will be an iconic moment for those of us lucky enough to attend Avo Uvezian’s 86th Birthday Dinner. Each year Corona Cigar Company hosts the dinner, bringing together all of us who love an exceptional meal and a great cigar. We are very proud to announce that we have out done ourselves this year, and will be having both the dinner and reception at the Downtown Orlando location. How is this outdoing ourselves you may ask, well for the first time since July 3rd, 2003 it will be possible to enjoy your cigar WITH your meal! We are excited to announce that Ruth’s Chris Steak House will be bringing their kitchens to our patio and cooking for the guests of the dinner. In 2002 Floridians voted to amend the Florida Clean Indoor Air Act to ban smoking anywhere that had employees. The only exceptions to this new legislation were bars and retail cigar shops with 10% or less of profits coming from food. Since the new legislation was put into effect we have not been able to smoke and eat in public establishments.